A legal tussle is currently on between a civil society group led by a professor, ostensibly working to further public interest, on the one hand, and the state government and an influential but controversial real estate developer, on the other. The dispute, which is over the way in which the Rajasthan government is seeking to re-develop Jaipur's historic Mansagar lake and its environs, is expected to be resolved soon by the Supreme Court of India. As you enter Jaipur, the capital of Rajasthan, the Mansagar Lake is a sight to behold. One of the largest man-made water bodies in the country, it was built in 1610 by Raja Man Singh I, the then ruler of Amer, by damming the Darbhawati river. 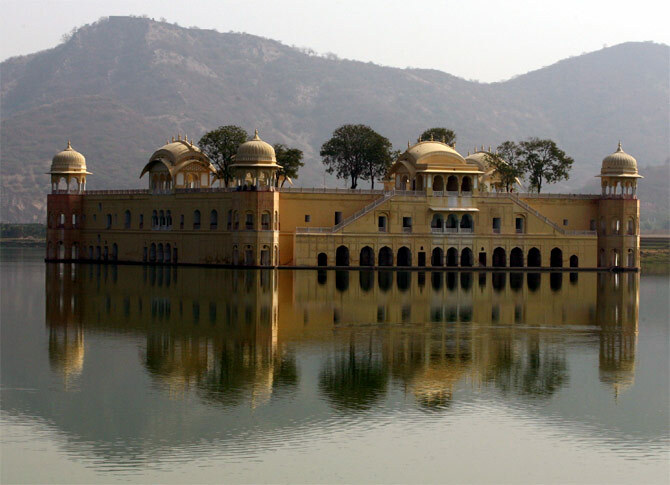 But this placid water body, built by a feudal lord for recreation as well as for irrigation, with an ornate palace (Jal Mahal) in its middle and a temple on its northwestern side, has become the subject of bitter contention in recent times. A legal tussle is currently on between a civil society group led by a professor, ostensibly working to further public interest, the one hand, and the state government and an influential but controversial real estate developer, on the other. The dispute, which is over the way in which the Rajasthan government is seeking to re-develop this historic lake and its environs, is expected to be resolved soon by the Supreme Court of India. The case against the state government over the re-development of Mansagar Lake was adjudicated in the Rajasthan high court and disposed of in May 2012. The state government had been accused breaching public trust, and the court asked it to nullify a "sweetheart deal" with the developers. It has been alleged that the Rajasthan government has "gifted" land worth Rs 3,500 crore to a private firm for 99 years for a piffling sum of only Rs 2.5 crore a year. An appeal against the high court's decision was made to the Supreme Court. In May 2012 itself, the country's apex court stayed the operation of the order of the Rajasthan high court on an appeal by the developer, Jal Mahal Resorts Private Limited. At the same time, the Supreme Court directed the company not to start any new construction but confine its work to "renovation and restoration". On September 10, a bench of the Supreme Court comprising Justices Gyan Sudha Mishra and Pinaki Chandra Ghosh heard the case and were shown a film on the Mansagar Lake/Jal Mahal re-development project by those in favour of it. Senior advocate Abhishek Manu Singhvi, who also happens to be Congress party’s member of Parliament and its spokesperson, requested Justice Mishra to visit the site herself which she subsequently did, on September 15, after inaugurating a library in the vicinity of the lake. The case was supposed to be heard in late-September and early-October. However, due to various reasons, including the non-availability of Rohinton Fali Nariman (senior advocate and former solicitor general of India) who is appearing for the respondents who have opposed the re-development project, the case is now expected to be heard from October 29 onwards. 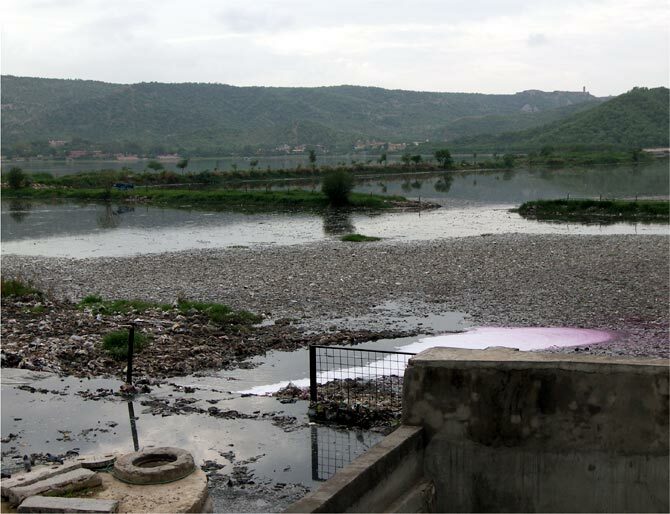 In 1962, sewage from Jaipur city was diverted into the Mansagar Lake by the Nagatalai and Brahampuri nallahs or canals, gradually ruining its ecosystem. 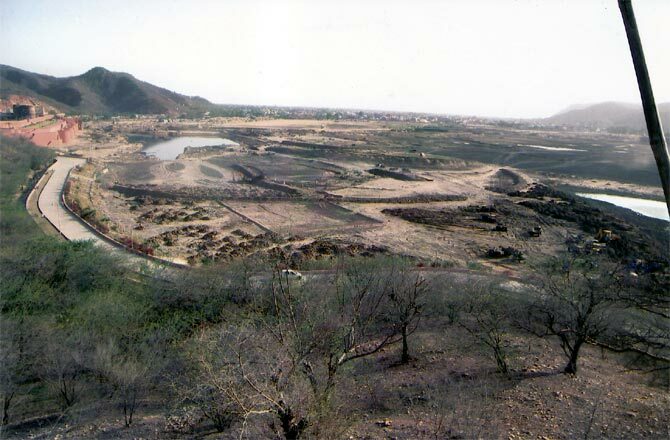 The situation was aggravated by the massive siltation caused by the deforestation of the surrounding Arawalli Hills and the entry in 1975 of the aquatic weed, water-hyacinth (Eichhornia crassipes). Lake Mansagar is classified as a notified wetland in state government records with a natural spread of 400 acres. Over the years, a crying need to restore the lake and its natural environment has been felt and some action has been taken. The lake and Jal Mahal palace were listed as protected monuments in 1968 and later deleted from that same list in 1971. Yet, conservation and restoration efforts for the lake by the Jaipur Development Authority in association with PDCOR Limited, which began in 2002, did pay off. (PDCOR or the Project Development Company Of Rajasthan, jointly promoted by the Rajasthan government and Infrastructure Leasing & Financial Services Limited to facilitate private sector investment in the infrastructure sector, was incorporated in December 1997 and commenced operations in May 1998.) Water levels in the lake increased with desiltation, weeds were manually removed, and the quality of water improved. Professor K P Sharma, professor of botany at Rajasthan University, filed a public interest litigation petition in 2011 in the Rajasthan high court at Jaipur against the state and Union governments, their various agencies including the state tourism department, the Jaipur municipal corporation, the JDA, the MoEF, PDCOR and two private firms -- Jal Mahal Resorts and KGK Consortium, praying for orders to desist from operationalising and reversing several specific agreements and licenses. Prof Sharma, who spoke to rediff.com, says he been involved in the study and management of ecological systems around the Mansagar lake for years. He wants the state government to review certain aspects of the project to develop Mansagar lake and restore Jal Mahal and wants the developer and the government to pay compensation for alleged damage done to the lake and its environment. The Jal Mahal Tourism Infrastructure Project was conceived and approved by the Standing Committee on Infrastructure Development of the Rajasthan government in December 1999. It was envisaged that the Jaipur municipal corporation would own the project. In 2000-01, bids were invited for the development and renovation of this historic tourist spot and its natural environment without identifying the land to be used and without conducting detailed studies to assess the environmental impact of such development. The bids were later cancelled and the JDA became the sponsoring agency for the lakeside development component in 2002 which was subsequently transferred to the state tourism department with the Rajasthan Tourism Development Corporation becoming the nodal agency for the project in 2003. Official records indicate that PDCOR had assisted RTDC for the bidding and while the JDA had been assisted by the MoEF. The RTDC asked for bids for tourism development in the lake area in 2003 and the project was eventually granted to KGK Enterprises, the promoters of Jal Mahal Resorts Pvt Ltd which was itself incorporated in 2004. KGK Enterprises was an HUF (Hindu Undivided Family) partnership entity and was, therefore, not eligible to bid since the bidding terms specified that only a public limited company or a private limited company could be eligible for bidding for the project. However, PDCOR advised that allowing KGK Enterprises to bid would “increase competitiveness”. KGK Enterprises, as it turned out, was the highest bidder and it signed two agreements with the state government -- the Mansagar Lake Precinct Agreement and the Jal Mahal Leave and License Agreement -- on November 22, 2005. It has been alleged that no proper survey was done of the land to be used nor any environment impact assessment report undertaken. Yet, 100 acres of the lake were identified and carved out of the natural spread for this project, that is, by reducing the size of the lake to 280.6 acres from the original 400 acres. This was apparently done in complete disregard of the fact that out of 400 acres, land available for development is 52.45 acres of which half is reserved for open/green spaces, making just 26.22 acres of land available the project. What actually happened was that from the 286.1 acres of the lake area, more than half or 152.22 acres were made available to the private developer, including 14.15 acres which were submerged. KGK Enterprises has been promoted by Jaipur-based real estate baron and exporter of precious stones and jewellery, Navratan Kothari. Two of his realty projects, the Entertainment Paradise Mall and the Mahavir Cancer Hospital, are prominent landmarks in the capital of Rajasthan. It may be noted that Kothari had been arrested in Indore on January 9 after a warrant had been issued against him by the court of the city magistrate in Jaipur. He was arrested in the Madhya Pradesh city where he had gone to attend a funeral ceremony following the demise of Vinay Lunkad, father of Rajiv Lunkad, general manager of Jal Mahal Resorts. The Jaipur bench of the high court of judicature for Rajasthan took up writ petitions (PIL numbers 5039/2010 and 4860/2010) filed by two non-government organisations, the Dharohar Bachao Samiti and the Heritage Preservation Society, apart from the writ petition (6039/2011) filed by Prof Sharma against the Rajasthan government and others. While the second and the third PILs sought cease and desist orders like the first one, certain new facts emerged from the petitions. Prof Sharma had averred in his petition that the lease which had been granted to JMR was for 99 years virtually amounting to an outright sale. In its petition, HPS had further contended that annual religious ceremonies that had been taking place at Jal Mahal and at the Peer Baba Ki Mazaar in the vicinity of the lake would be adversely affected since the land area would be reduced by almost one-third if the developer and the state government had their way to build a seven star hotel at the location. The petitioners have argued that building the proposed hotel would be in direct contravention of the Rajasthan high court’s order of February 2008 in another case and would also violate Articles 48A and 49 of the Constitution of India, among other provisions. HPS also averred that other factors that could serve as the “main grounds to assail the transaction in question” included non-clearance of the tourism project by the MoEF, contravention of a notification issued by it, violation of the doctrine of public trust, the "illegal" transfer of 100 acres which are part of the lake bed, and "invalid" transfer of land owned by the JDA and the municipality to RTDC. It has been contended that the authorities have deliberately misrepresented the size of the area lake and its surrounding areas to be 310 acres "with a mala fide intention to carve out 100 acres project area out of the bed of the lake”. The petitioners have argued that valuable public property is being sought to be "gifted" under the guise of tourism development. The land is valued at Rs 3,500 crore and at an annual lease of five per cent, the lease rental works out to Rs 175 crore per annum, not Rs 2.52 crore as per the lease granted. Prof Sharma claims that the market price of such land is much higher than the price calculated on the basis of government rates. Says he: "It is very hard to find a space of 100 acres of land in the centre of an urban area, surrounded by such a picturesque and ecologically rich location…such land is invaluable." In their responses to the writ petitions in the high court at Jaipur, the state government has argued that the Master Development Plan 1976-91 of Jaipur city “contained provision of various facilities on south and west side of Jal Mahal Lake in 200 acres”. Similar provisions were retained in the Master Development Plan 2011. It is also claimed that the MoEF has "appreciated the project" and agreed to compensate 70 percent of the cost of the project. The government has further claimed that it was for fellow respondent JMR to “obtain clearances as per requirement of law” and that the Mansagar lake did not come under the purview of the Wetland Rules of the Union government's MoEF. The JDA contended that much of the land had been acquired from private owners in three villages, together with land owned by the government's public works department. The authority admitted that the acquired area included 13 bighas and 17 biswas of land that was part of the lake bed and under water, known as the Gairmumkin talab (water body). The senior counsel for RTDC had clarified that the area "was not forming… part of (the) lake at present”. The counsel for PDCOR also maintained that the talab "was not part of the water body, but was part of land mass area". In September 2009, a committee chaired by the chief secretary of Rajasthan approved a revised layout plan, under which the lease rental amount was to be enhanced by 10 percent "every time after a period of three years…Thus, considering the nature of investment, (a) lease of 99 years is justified." The entire dispute got murky with the response of the lessees, Jal Mahal Resorts Pvt Ltd and KGK Enterprises. They submitted that whatever transactions had taken place had happened with the full approval and sanction of all authorities concerned including the MoEF and that they had won the bid because it was the highest bidder. They averred that Prof Sharma “is not (a) recognised authority or lake conservationist or expert in lake management, irrigation, environmental protection”. They claimed that the petitioners had orchestrated a campaign against the project through a local newspaper (Rajasthan Patrika), whose owners run a trust called the Janmangal Trust which maintains the Mansagar dam on behalf of the state irrigation department. It was further claimed that the newspaper's owners had other commercial interests and that in 1992, the newspaper group had wanted to "utilise the Jal Mahal complex and the land which is part of Jal Mahal Tourism Project for its own benefit and commercial use… free of cost/(or for a)paltry sum and having failed to grab the land, (a) hostile campaign has been started against the project…attempting to hold a media trial…"
JMR denied the allegations of the petitioners. It contended that the project is “in larger public interest”, that it had undertaken the restoration of the lake and that it is developing only 50-60 acres for which it had received clearance in 2009-10 from the state government after the preparation of an environment impact assessment report. The developer has also argued that Jal Mahal was never a place of worship for either Hindus or Muslims and was rather a place for the pleasure of kings who hunted ducks in the lake. JMR also said it did not claim any proprietary rights over the monument, that it would maintain some 87 percent of the 100 acres as a green area; and that it had already invested Rs 15 crore in restoring the lake without disturbing the catchment area. JMR also stated that it had incurred an expenditure of Rs 70 crore “without taking any loan” and had executed various works such as the diversion of sewage nallahs and the construction of sedimentation tanks, thereby increasing the holding capacity of the lake as well cleansing its waters. In its submission, the MoEF clarified that in December 2002, it only sanctioned the project for the conservation and management of the Mansagar lake. It seemed to be satisfied with the assurances received from the state government about how restoration and management activities were to be undertaken and sustained, though in its submission to the court, the MoEF also said that new construction activities would require prior environmental clearance from the central government or the State Environment Impact Assessment Authority constituted by it. Importantly, the MoEF's submission added: "(The) Wetland Rules were notified on December 4, 2010 and as per the said rules, there are certain activities which are prohibited and also cannot be undertaken within the wetlands without the prior approval of the state government." So who was telling the truth about the re-development of the historic Mansagar lake and Jal Mahal? Was it the petitioners, including the professor of botany and civil society activists? Was it various agencies of the state government? Was it the private real estate developer? Or was it the Government of India's environment ministry? Don't miss the second part of this article to find out what the high court of Rajasthan had to say on May 17, 2012, and whose views may (or may not) be endorsed by the Supreme Court of India.